Jun Takeuchi has been very busy the last few years, dedicating his time to franchises like Onimusha, Lost Planet, and of course Resident Evil. With the latest installment of Capcom-brand survival horror, Takeuchi has been battling accusations of racism and complaints about the dated controls, all while serving up four million downloads of the demo. He didn't have to deal with any such matters back in the days of Resident Evil 2, that's for sure. We met up with Takeuchi during his recent stop in Los Angeles to discuss these issues and other hot topics. Find out what he had to say after the break. At what point did you decide to add the westernized control scheme that you have available in Resident Evil 5? We decided very early on in the development that that was something that we wanted to put in and something that would be good for the game and help people in the West to play it. So we decided very early on to put it in there. We did spend a lot of time testing it before we revealed it to anyone. We expect that the game will sell more in North America. So do you think Resident Evil 5 will be more popular in the West than it is in Japan, especially given the Xbox install base in Japan? If you are talking in terms of the sales numbers, yeah, we expect that the game will sell more in North America than it will in Japan. That is for sure. What influenced the team to go entirely co-op this time? I guess the biggest reason is that we wanted to create a new experience for the player. We didn't always want to have the player playing a single player game. So in Resident Evil 5 we really want to advance the series on from Resident Evil 4 and to allow the users to do something in the game that they have never been able to do before. Our answer to that was co-op; to allow the players to play with a partner and to experience the game in a different way. Speaking of the co-op gameplay, there appears to be a lot of wasted space on the sides of the screen in the split-screen mode. Was there a particular reason to go that route? There were two main reasons that we decided to do it like that. The first one is we wanted to preserve the 16:9 ratio on the screen when you are playing in 16:9 ratio co-op. That was important, not just because the game looks best like that, but also because it affects the way that you control the game. If you took up one half of the screen with one of the windows, the character would end up being much wider in the screen. Then obviously it would be much smaller at the top. So actually it became quite difficult to control when we had it running like that. That was one reason. The other reason was that we felt when you are sitting on the sofa with somebody else playing the split screen, if you have the two screens just right on top of each other; it was actually quite difficult to see and separate your screen from the other person. So we felt that if you are going to be playing co-op, you are probably going to be sitting beside each other. So we wanted to have the two screens beside each other a little bit off-set like that. Besides the co-op gameplay, what other innovations are you bringing to the Resident Evil series with this version? There have been a lot of evolutions to the Resident Evil formula in this game, particularly in the smaller areas that you might notice the first time while you are playing it. One example of that is you don't save the game using the typewriters anymore at the end of every chapter. So there are a lot of small evolutions of the formula in this game. You will see that as you play through it. When you open up the menu screen to select items in Resident Evil 5, you do that in real time. Why did you decide to delineate from actually pausing the game when using the item menu? The reason we wanted to have that is because the game is divided up more into chapters than it was before. We wanted the experience to be seamless while you are playing the chapters. You don't stop to do anything while you are playing the chapter. You go straight through it, and then at the end of every chapter you can kind of review where you are and have a bit of a chance for a break. But while you are playing through the game, it is relentless. We were trying to make the player feel the tension of not being able to move as freely. Have you played Dead Space? That was EA's take on survival horror. If you did, what did you think about it? I didn't get to play it very long. I did play it a little bit. I thought it was very well made. Part of Resident Evil is the moving and shooting: you don't do both at the same time. Is that limitation important to Resident Evil as a series as it affects gameplay? I can't really say that it is important for a Resident Evil game that you have that restriction on the player. 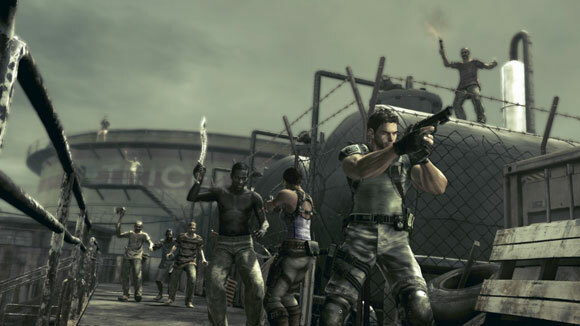 What I can say is that it was important for the game that we were trying to make in Resident Evil 5 to place the player in that situation of fear, and to have them feel the tension of not being able to move as freely. That was certainly an important part of the game design and the feeling that we were trying to create in the game. Do you think the criticisms against the game's controls are misplaced? Are the criticisms frustrating, or did you expect a certain amount of that going in? Obviously the criticism that will be coming from the fans right now is from people having played the demo. I certainly want to put out that we were aware that that criticism was going to come up and it was going to be something that we dealt with. So we were prepared for that. However, looking at the feedback that we have been getting back from the members of the press who have played the build that we sent out, we think that if you play the full game and you play the whole experience, it is much easier to understand why the controls are the way they are. It actually makes it a more interesting game the way it controls. So we think that when the game is out there on the shelves, the users will understand that a lot more, and maybe that criticism will disappear. The Wii has taken such a large lead in sales, and Resident Evil 4 did so well on the Wii. It's also cheaper to develop games for the Wii. With that in mind, why is this a PS3 and Xbox 360 exclusive title? Was that a creative decision?